Babies are only little for a short time but they need all of our love, care, and affection to make sure that they grow into healthy and happy adults. We don’t think about baby teeth any differently. Taking care of baby teeth is as important as taking care of adult teeth. 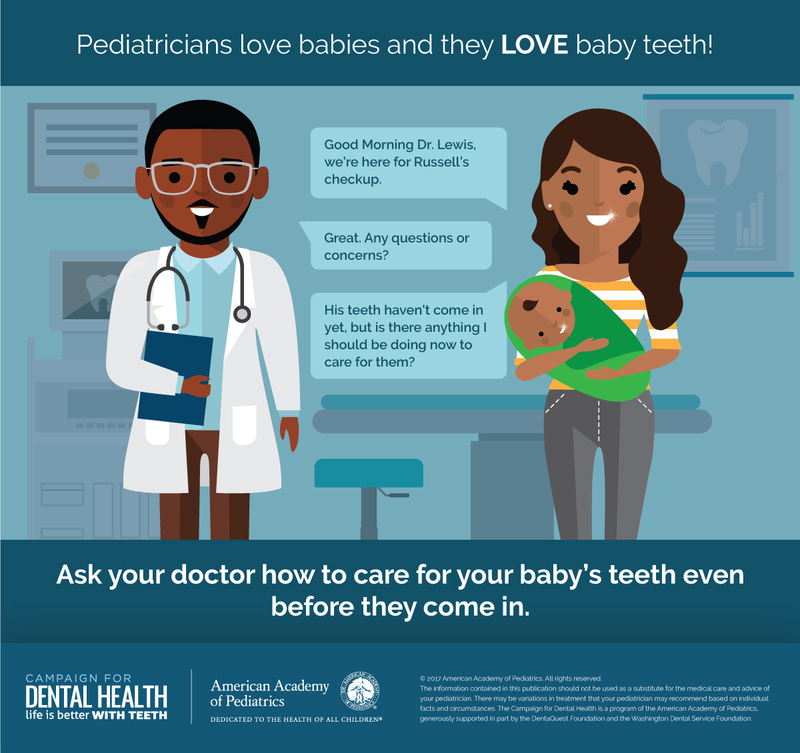 If you aren’t sure about what it means to take care of baby teeth even before they come in, ask your pediatrician for help. She can tell you when to wipe your baby’s gums, what to look for when teeth start to appear in the mouth, how to handle teething pain, when to start using fluoride toothpaste (as soon as you see a tooth), how to get your toddler to let you brush his teeth, when to see the dentist (first birthday, first dental visit!) and any other questions you might have about oral health. As your child grows your pediatrician can continue to help you to keep her mouth healthy by providing fluoride varnish treatments, referring you to a dentist, and providing counseling about things like diets that are good for teeth, getting to sleep without a bottle, and avoiding oral injuries. Make it a priority to ask your pediatrician about how you can partner with her to ensure a healthy mouth for your child. We encourage you to share the following videos and download the shareable images for use on social media channels. Thank you for sharing!